We have a full preview of the Super League and Championship seasons, and we make our tips on the finishing positions of clubs in Super League this year. We speak to the London businessman who is making a bid to buy Bradford Bulls. RFL CEO Nigel Wood congratulates Wigan and Huddersfield on their opening night Super League game. Dewsbury Rams coach Glenn Morrison gives his reaction to being shortlisted for the New Zealand coaching job. Jamie Rooney tells us about his decision to retire. Martyn Sadler looks forward to Round 1 of Super League in which every game is highly significant, while he also expresses some sympathy for Sam Burgess and recommends having a late night on Friday to watch Sam Tomkins in the NRL Nines in Auckland. Garry Schofield gives Sam Burgess some advice, and Malcolm Andrews also writes about the South Sydney star. Gareth Walker, on the other hand, reveals some details of the new financial and other arrangements for Championship clubs. Our amateur editor Phil Hodgson celebrates the growing geographical spread of amateur Rugby League. We check out what is waiting for Wigan when they take on New Zealand Warriors at Hamilton this Friday. We speak to Castleford Tigers CEO Steve Gill about his club's improving finances. We speak to Super League coaches Paul Anderson, Craig Sandercock, Brian McDermott, Tony Rea and Denis Betts. 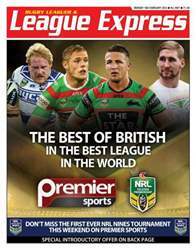 We speak to Hull FC skipper Gareth Ellis, to St Helens star Jonny Lomax, to Warrington star Stefan Ratchford and to Bradford star Adam Sidlow. We have reports on all the weekend's pre-season matches, both in England and in Australasia. We cover all the regional amateur leagues, with results and reports, as well as the latest games in the Tetley's Challenge Cup. We have a report of the weekend's Rugby League in France. In League Talk we cover the game at grass roots level.